There are a few movies we keep returning to, playing them many times a year. These are almost always uplifting, humorous pieces that cheer us up. This is just such movie for me. Includes an Academy Award winning performance by Jessica Lange (best supporting actress) as Julie but the entire cast are just excellent; Teri Garr is wonderfully over-the-top. Indeed, it is this film’s misfortune to be up against Ghandi in the awards otherwise it would certainly have won more of its 10 nominations. 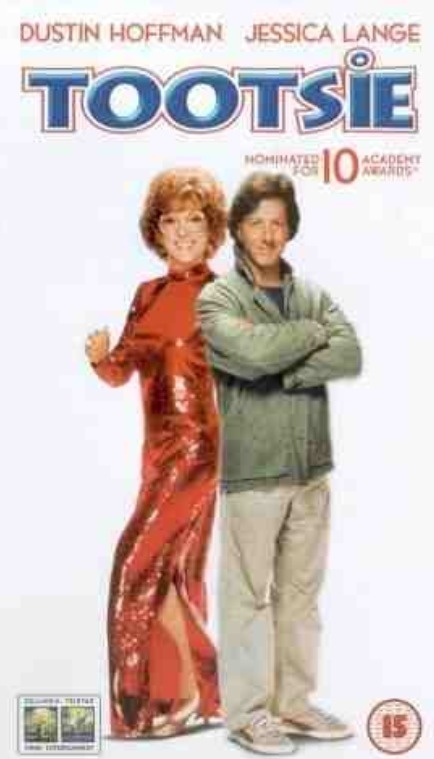 Certainly Dustin Hoffman should have special recognition. Superb. Michael is a professional actor with a wealth of experience and obvious talent but has built up a reputation that leads to his agent informing him that no one will hire him. As desperation takes hold he decides to try for a female lead in a soap opera and is, even to his surprise, cast. So ‘Dorothy‘ is born. The various cross-dressing humour leads this movie down some extremely well constructed and played scenarios. For Michael the primary issue is his budding love for a female cast member, who thinks he is, of course, a woman. The surreal nature of Michael’s existence and the reality of the world inhabited by Julie (said love interest) play well against each other. Michael’s desperation though affects all around him as he has to try harder and harder to maintain the illusion yet desperately wants just one person to know the truth. A movie that will keep you giggling and laughing out loud, no matter how many times you watch it.